Does your double glazing door give you problems? Well, you do not need to have any sleepless nights over having to buy a new door as 80% of the times we will be able to help you get your door running back like new and that too on our first visit! There are a few common problems which are associated with double glazing doors and with the number of years of experience that we have in the business we are pretty much aware of how to tackle most of them or at least detect them. Not only that, we are so confident about our work that we are ready to give you a guarantee for the repairs that we conduct on your double glazing door be it made of timber, UPVC, or aluminum. Due to its age or the usage pattern a door may just get worn out or some part of it will get broken because of wear and tear; therefore, we target the specific part of the door which is malfunctioning. Thereafter, we either replace that part or fix it so that it can cause no further problems to you for a long time. Sometimes the doors are of an older technology so the parts become obsolete therefore are not easily available. We tend to handle such situations by finding the part which is closest to the original which needs replacement and making sure that you get full satisfaction from the repair. Many of the times your patio door which is a sliding door made of timber, UPCV or aluminum starts to slide off the square and when you try to close it, after a lot of tussle with the door lock, you finally manage to get the door aligned so that it locks. However, if this problem persists then the part will give in very soon requiring it to be replaced. A stitch in time saves nine so timely action can prevent your costs from accumulating for repairs and ensure that your door does not become beyond repair, forcing you to purchase a new one. The bottom track may also start to pose a problem but our expert door repair engineers know how to counter all such problems. Adjusting hinges or repairing locking mechanisms on your double glazing doors is a skill that our engineers have mastered and once they are done with the job, you will never know that it ever had a problem. The wooden doors pose a different issue primarily that they get scratched or the lock gets jammed. Armed with their trusty repair kits, our experts can even make your old door look brand new by a mere flick of their wrists, using a substance which blends the scratched area with the rest of the door. E.g., if you move into a new house and don’t like the look of the existing door, don’t get the door changed but simply change the glass! Call us and we are sure you will be happy that you did. Bounds Green Locksmith , is a established locksmith firm with well trained professional staff and a huge list of satisfied clients who return to us for any locksmith needs. Burglary repair Bounds Green , we have vans well equipped with the modern technology tools to enable us to programme transponder keys, repair broken keys quicky.Bounds Green Emergency Locksmiths , we guarantee a quick response to emergency calls and will be on site within 30-60 minutes.Bounds Green Burglary Damage repair , ensure your property is secured and advices to prevent from any future burglary. 24 Hour Locksmiths in Bounds Green , our team of expert locksmiths with the use of modern tools complete the work quickly, keeping the chargeable time to a minimum.Double glazing repair Bounds Green , business and residential customers can be sure they receive the best of the service and of the highest standard. Bounds Green Broken Door repair , in case our client need extra or replacement keys we can there to help. Our locksmiths can even replicates the keys without an original with the use of advanced technology tools that we carry on board. Boarding up Bounds Green , N11 , N22 Locksmiths , all our is guaranteed, and to British standard. Locksmiths Bounds Green , Our vehicles reach the site with all the equipment and tools that our locksmiths need to complete the job. locksmith N11 , N22 , we are known for providing high quality service to our clients. Reliable and honest locksmiths in the Haringey area! ABC Locksmiths offer a full range of locksmith service for residential and commercials customers. We can board up broken window for security as a temporary but reliable solution. We have specialist who can repair or replace the faulty double glazed units. Be it be UPVC, Aluminum or timber we have a permanent & honest solution for this problem. Call us anytime; we will be happy to assist you in all possible ways. We have expert technicians local to N11 area who will fix burglar alarm systems for your safety and security. We take the survey of your property to ensure highest security and design the alarms accordingly and matching your requirements. We never compromise on security and work according to British standards. Our experienced staffs are available 24 hours in case you experience any problems. We provide alarms for all types of premises from small house to shop and factory unit. 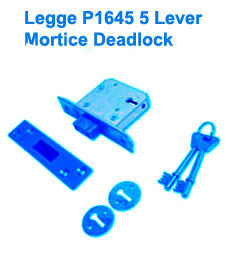 Legge P1645: Mortice 5 Lever deadlock. Case size of 64mm. Case is yellow finished with either Satin Chrome or Brass forend finish. Comes with 2 number of keys. Can be operated from both the sides. In house keyed alike. Keys vary in excess of 500 variations. Comes with matching escutcheons. Follows a 5 lever mechanism.